The beautiful color of the Gold Gourami makes this a very desirable addition to an aquarium, but it does get big and can become belligerent to small tank mates! The Gold Gourami is a very attractive color-morph of the Three Spot Gourami Trichopodus trichopterus (previously Trichogaster trichopterus). It is one of the more vibrant colored varieties. It has a pretty gold tone and a deeper toned striped patterning along the back, but it lacks the two dark spots seen on its parentage. This pretty fish makes an attractive addition to the aquarium. This gourami has been developed in captivity for the aquarium trade, first appearing in 1970. Breeders selectively pair individuals for their desired coloration and strengthened it over several generations. Other mutations include a silver blue variety with darker blue markings that was developed from the Blue Gourami. It is known as the Cosby Gourami after the American breeder named Cosby that developed it. The Cosby Gourami was further developed into the Opaline Gourami or Marbled Gourami. A silver color form called the Platinum Gourami also appeared in 1970. These are Labyrinth fish, also called Anabantoids, which are distinguished by having a "labyrinth organ". This organ allows them to get air at the surface of the water. Like other fish they have the ability to pass water through their gills to obtain oxygen, but they are also able to breathe atmospheric oxygen. Another characteristic of the labyrinth fish is that of being a bubble nest builders. The male will build a bubble nest at the surface of the water and once the female lays the eggs, he will place them in his nest and guard them until they hatch. Though the coloring is much different than their predecessors in most other aspects the Gold Gouramis is very similar. They are the same in size and care requirements, its only the temperament of the adults that is a bit more contentious. These are certainly some of the hardiest fish available to the aquarist, and make excellent first fish for people entering the hobby. They are long lived fish with each having a remarkably individual personality. They will use their pelvic fins to feel their environment and even feel their tank mates. They also seem to be quite aware of their owners. This gourami is considered a good community fish when small, but that can change as they mature. Some will remain peaceful while others can become belligerent, sometimes attacking smaller fish. Among themselves the males are territorial and will squabble. The best tankmates are other fish that are of similar size and temperament. They can get quite large, up to 6 inches (15 cm) in length, though most are a bit smaller than that in the aquarium. Juveniles will soon outgrow a small aquarium and then will need to be provided with more space. When young they can easily be housed in a 15 - 20 gallon aquarium, but adults will do better with at least 35 gallons. The tank should be decorated in a way which allows both the dominant and quieter personality type fish to live happily. Provide some densely planted areas to create a few hiding places and they will also appreciate the cover of floating plants for some shadowy areas. This is the first in the series of upcoming Fish Profiles. This film focuses on the Gourami. The Gold Gourami is a captive bred color-morph of the Three Spot Gourami that first appeared in the aquarium industry in 1970. The Three Spot Gourami Trichopodus trichopterus (previously Trichogaster trichopterus) was described by Pallas in 1770. It is found widespread throughout continental southeast Asia and Indonesia. The Gold Gourami is an elongated fish and somewhat compressed laterally. The fins are rounded and relatively large. The ventral fins are threadlike and carry touch-sensitive cells that are extremely perceptive. This fish has a labyrinth organ, a part of the fish which allows it to absorb atmospheric oxygen directly into the bloodstream. It can reach about 6 inches (15 cm) in length, but will generally be a bit smaller in the aquarium. They will be able to breed at about 3 inches (7.5 cm). They have an average lifespan of 4 to 6 years, but can live longer with good care. The body color is a pretty gold tone with a deeper toned striped patterning along the back. The two dark spots seen on the Three-spot Gourami are absent. White spots extend on to the fins, giving them a very attractive pattern. Size of fish - inches: 5.9 inches (15.01 cm) - They can reach almost 6" (15 cm), but are usually a bit smaller in the aquarium. They will breed at about 3" (7.5 cm). This fish is undemanding and can tolerate a range of tank conditions. It will generally accept a wide variety of foods and is fairly easy to breed. However as these fish age they can become a bit nippy. Being quite hardy it can be a good choice for the first time fish keeper, but with its more aggressive tendencies as it matures, tankmates will to be selected with some care. Aquarist Experience Level: Beginner - They are hardy, so good for a beginner in that respect, but they do become more aggressive as they mature, so tankmates need to be selected with some care. The Gold Gouramis are omnivorous and will generally eat all kinds of live, fresh, and flake foods. To keep a good balance give them a quality flake or pellet food as the base to the diet. Supplementation should include white worms, blood worms, brine shrimp, or any other suitable substitute. Fresh vegetables can be offered as well, blanched lettuce being a good option for many aquarists. Generally feed once or twice a day. The Gold Gourami will swim in all parts of the tank. Juveniles can easily housed in a 15 - 20 gallon aquarium, but as they grow to adult size they will need at least 35 gallons or more. Keep the tank in a room with a temperature as close as possible to the tank water to prevent damaging the labyrinth organ. The tank should have an efficient filtration system but should not to create too much of a current. This fish will be bothered by a strong current in the tank, especially if the tank is small. Air stones can help provide well oxygenated water. The tank should be decorated in a way which allows both the dominant and quieter personality type fish to live happily. This means the construction of a few hiding places and some dense plant cover. These gouramis will show their colors best on a dark substrate. They also like the cover of floating plants, however they will regularly breath air at the surface so its important to have some open areas. Temperature: 73.0 to 82.0° F (22.8 to 27.8° C) - Keep the surrounding room temperature consistent with the water temperature will help avoid trauma to the labyrinth organ. Water Region: All - The Gold Gourami will spend time at all levels of the aquarium. Although this fish is merely a color morph, it is a more belligerent fish in the community tank than the Blue Gourami and the males tend to fight amongst themselves. A community tank is not out of the question, but some thought must be put into selecting robust tankmates of a moderate size. Individuals will show varying degrees of aggression as they mature, with some being very belligerent and others being more peaceful. These species have been known to attack smaller fish. The aquarist should be prepared to adapt their tank to suit all personality types. Temperament: Semi-aggressive - This color morph of the Blue Gourami is comparatively more belligerent. This fish may be rough with smaller tankmates, increasingly so as it ages. It is also a skilled hunter so smaller tankmates will probably be consumed. Same species - conspecifics: Yes - As they mature some remain peaceful while other can become quite belligerent. Males are territorial and will tussle amongst themselves, becoming very aggressive when breeding. Peaceful fish (): Safe - Will need to monitor compatibility as the fish matures. The male Gold Gourami has a longer and more pointed dorsal fin while the female's is shorter and rounded. Like most Labyrinth fish, the Gold Gouramis are bubble nest builders. Breeding is fairly easy and providing a breeding tank that is to their liking is perhaps the biggest challenge. A pair will be most likely to spawn if there is a fair amount of plants, a good sized surface area, and the temperature is to their liking. Prior to spawning they should be well conditioned with small offerings of live and frozen foods several times a day. When well fed, females should begin filling out with eggs, appearing very plump. 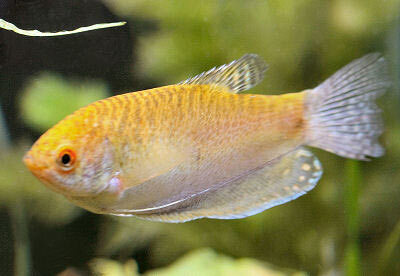 Gold Gouramis are very hardy so disease is not usually a problem in a well maintained aquarium. Some diseases they are prone to are bacterial infections, constipation and Hole in the Head if good water quality, nutrition, and maintenance is not provided. With any additions to a tank such as new fish, plants, substrates, and decorations there is a risk of introducing disease. It's advisable to properly clean or quarantine anything that you want add to an established tank prior to introduction, so as not to upset the balance. The Gold Gourami is readily available both in stores and online and is moderately priced. Check they're sexes. males have longer dorsel fins making it all the way to the tail. Females dorsel fins are shorter and more rounded. Opposite sexes are known to chase one another. My male is smaller than my female and she's beatin on him, chasing him and cornering him. I have had to put a tank separator in. Is this normal?